Contact Alfa Romeo of San Diego today for information on dozens of vehicles like this 2019 Alfa Romeo Stelvio . Want more room? Want more style? This Alfa Romeo Stelvio is the vehicle for you. There's a level of quality and refinement in this Alfa Romeo Stelvio that you won't find in your average vehicle. This is about the time when you're saying it is too good to be true, and let us be the one's to tell you, it is absolutely true. The Alfa Romeo Stelvio will provide you with everything you have always wanted in a car -- Quality, Reliability, and Character. 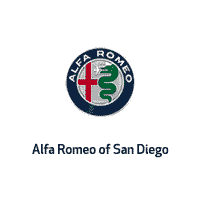 This 2019 Alfa Romeo Stelvio is proudly offered by Alfa Romeo of San Diego This SUV gives you versatility, style and comfort all in one vehicle. You deserve a vehicle designed for higher expectations. This Alfa Romeo Stelvio delivers with a luxurious, well-appointed interior and world-class engineering. You could keep looking, but why? You've found the perfect vehicle right here. This is about the time when you're saying it is too good to be true, and let us be the one's to tell you, it is absolutely true. You can find this 2019 Alfa Romeo Stelvio Sport and many others like it at Alfa Romeo of San Diego. Want more room? Want more style? This Alfa Romeo Stelvio is the vehicle for you. There's a level of quality and refinement in this Alfa Romeo Stelvio that you won't find in your average vehicle. This is about the time when you're saying it is too good to be true, and let us be the one's to tell you, it is absolutely true. This vehicle won't last long, take it home today. This outstanding example of a 2019 Alfa Romeo Stelvio Sport is offered by Alfa Romeo of San Diego. Want more room? Want more style? This Alfa Romeo Stelvio is the vehicle for you. You appreciate the finer things in life, the vehicle you drive should not be the exception. Style, performance, sophistication is in a class of its own with this stunning Alfa Romeo Stelvio. Just what you've been looking for. With quality in mind, this vehicle is the perfect addition to take home. Based on the superb condition of this vehicle, along with the options and color, this Alfa Romeo Stelvio Sport is sure to sell fast. Contact Alfa Romeo of San Diego today for information on dozens of vehicles like this 2019 Alfa Romeo Stelvio Ti Sport. Want more room? Want more style? This Alfa Romeo Stelvio is the vehicle for you. You deserve a vehicle designed for higher expectations. This Alfa Romeo Stelvio delivers with a luxurious, well-appointed interior and world-class engineering. When the Alfa Romeo Stelvio Ti Sport was created, it was automatically enhanced by having the performance ability of all wheel drive. Not only will you notice improved steering and superior acceleration, but you can also rest easy knowing that your vehicle comes standard with increased stability and safety. You've found the one you've been looking for. Your dream car. This 2019 Alfa Romeo Stelvio Ti Lusso is offered to you for sale by Alfa Romeo of San Diego. Want more room? Want more style? This Alfa Romeo Stelvio is the vehicle for you. There's a level of quality and refinement in this Alfa Romeo Stelvio that you won't find in your average vehicle. Enjoy the grip and control of AWD performance in this nicely equipped Alfa Romeo Stelvio. You could keep looking, but why? You've found the perfect vehicle right here. This 2019 Alfa Romeo Stelvio Ti Sport is offered to you for sale by Alfa Romeo of San Diego. Want more room? Want more style? This Alfa Romeo Stelvio is the vehicle for you. Pull up in the vehicle and the valet will want to parked on the front row. This Alfa Romeo Stelvio is the vehicle others dream to own. Don't miss your chance to make it your new ride. All-wheel drive means peace of mind all the time. This Rosso Competizione AWD Alfa Romeo enjoys a host offeatures, including exceptional acceleration and superior stability so you can drive with confidence. You could keep looking, but why? You've found the perfect vehicle right here. 2018 Alfa Romeo Stelvio Quadrifoglio 138 Point Inspection By ASE Certified Mechanic.Come see us at Alfa Romeo of San Diego. Alfaroemoofsd.com. 2019 Alfa Romeo Stelvio Quadrifoglio 138 Point Inspection By ASE Certified Mechanic.Come see us at Alfa Romeo of San Diego. Alfaroemoofsd.com.